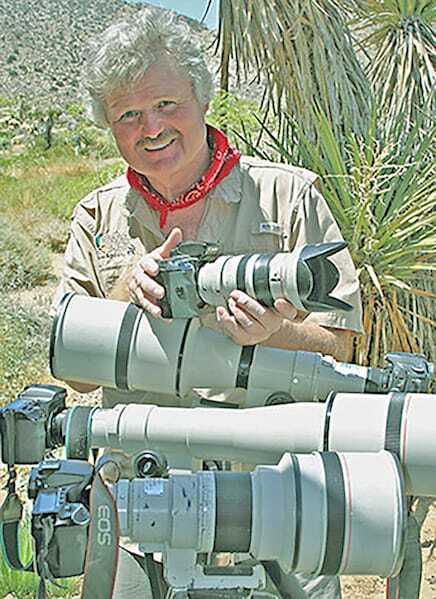 A new book by Joshua Tree’s nature photographer David Jesse McChesney highlights Southwestern birdlife. Bobcats aren’t fans of snow. Their expressions say it all in close-ups captured by David Jesse McChesney, a photographer who lives adjacent to Joshua Tree National Park. On social media, thousands of people are smitten with McChesney’s images of his frequent backyard visitors: Bobbo and Lil Bobbo, a father and son, who climb, hunt and drink under the photographer’s watchful eye. Viewers also love McChesney’s shots of stunning desert sunsets, wildflowers, howling coyotes, reflective lakes, moody mountain fog, starry skies and winged beauties, including insects, taken on adventures throughout the Western Hemisphere over nearly five decades. He has photographed in 55 U.S. national parks and many national wildlife refuges, rivers, shorelines and protected lands. He believes his latest book, American Birdlife: Treasures of the True Southwest, contains the most comprehensive collection of desert birdlife imagery ever published. McChesney’s previous books are The Mojave Desert: Miles of Wonder (cataloged in the Department of Interior Library) and Muir Roots: At One with the Wild. His new birdlife book presents more than 1,200 images, including 400 species he photographed in 100 areas of the nine Southwestern states. Readers will learn about birding hotspots and how to plan trips for the best time of year, plus how to identify and photograph, without scaring off the subjects. Bobbo and Lil Bobbo, father and son, visit David McChesney’s yard, next to Joshua Tree National Park. Snow Creek was the early impetus of McChesney’s fascination with the wild. As a young Los Angeles native, he visited his grandparents, near what is now Whitewater Preserve. He caught his first fish there, at about age 5, when there was a hatchery. He credits his late grandmother, Margaret Muir, for encouraging him to run around outdoors and enjoy nature. McChesney said he is distantly related to, but not descended from, famed naturalist John Muir, though he knew nothing of him until he went to Fullerton College. This connection makes him feel proud and makes his work meaningful, he said. 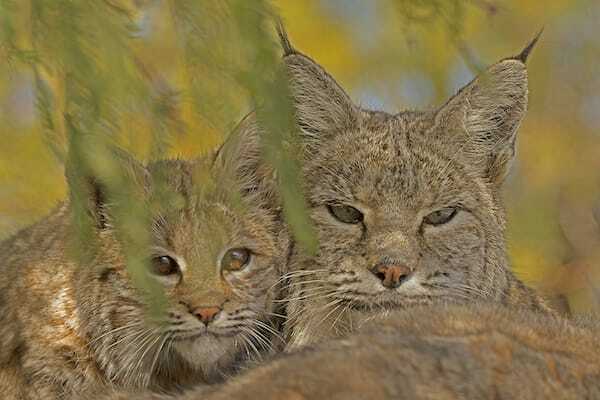 When McChesney was a teen, his mother gave him a camera and he shot a few rock concerts, then began snapping wildlife. Eventually, he set off to show Americans that the Mojave Desert isn’t a wasteland; it teems with activity. Along his journey of discovery, he grew curious about bears, wolves, and whales. So, he began saving for long lenses and long trips to Alaska, Hawaii, the Galapagos and Pribilof islands and Patagonia. More recently, he has focused entirely on American photography, though his work has been published in 80 countries, he said. McChesney is a former advanced photography instructor at Desert Institute at Joshua Tree National Park. His work has been included in the Interior Department’s National Park Gallery in Washington, D.C. and at the state Capitol. McChesney has promoted the Mojave by organizing events, fundraising and visiting federal legislators. He also gives presentations to photography clubs and helps preservation organizations, such as Sierra Club and Transition Habitat Conservancy, by donating images or a portion of his sales. David McChesney ready to take on nature. One of McChesney’s favorite shots in his new book is of two Whooping Cranes fighting over Blue Crab territory in the Intracoastal Waterway of Texas, at Aransas National Wildlife Refuge. His other cherished successes include close encounters with Alaskan bears. McChesney also took eight trips to Texas before getting pictures of the Groove-billed Ani, and he spent months setting up his best photo ops with Pileated Woodpeckers in the Upper Peninsula of Michigan. As far as celestial events go, he said photographing Halley’s Comet in 1986 “was a real treat.” His most popular image is “Lil Wiley Howling” (a young coyote), which he sells in seven states. 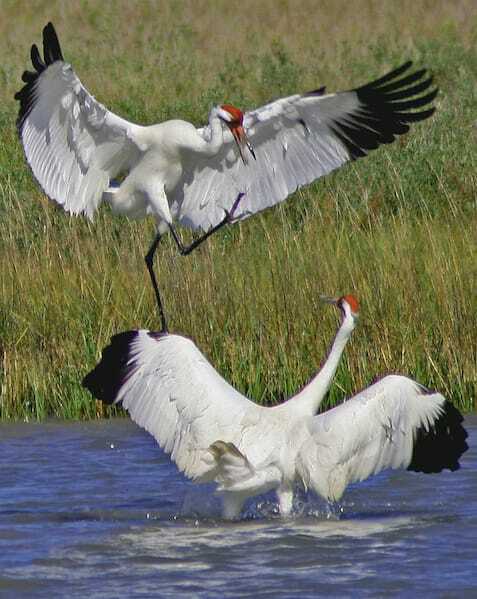 One of McChesney’s favorite shots: Whooping cranes fighting over blue crab in Texas. McChesney’s “go to” cameras include Canon 5Ds, 7D and 6D, with lenses from 8mm to 800mm. 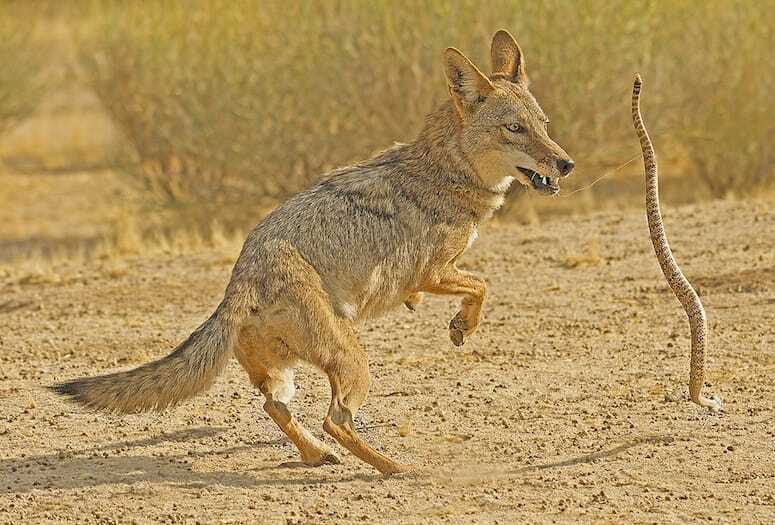 However, he used a Nikon 200-500mm lens mounted on a Canon 7D to grab an image of two coyotes scrambling to grab a gopher, for example. When he isn’t photographing, McChesney, now in his 60s, can be seen playing harmonica, like a force to be reckoned with. He has performed around the country as “Hurricane David,” mostly in the Las Vegas area, but also as far afield as the Mississippi Delta and on the longtime syndicated King Biscuit Radio Show, based in Arkansas. In 2008/2009, he was named National Harmonica Champion at a contest at the National Harmonica Festival and National Harmonica Championship in Yellow Pine, Idaho, he said. During his performances, he sometimes highlights the Mojave and his photography, weaving his life’s work together. McChesney will sign books at Cabot’s Pueblo Museum in Desert Hot Springs from 10 a.m. to 1 p.m. April 13, as part of their Earth Day Celebration. For other upcoming events, visit his Facebook page, facebook.com/david.mcchesney. 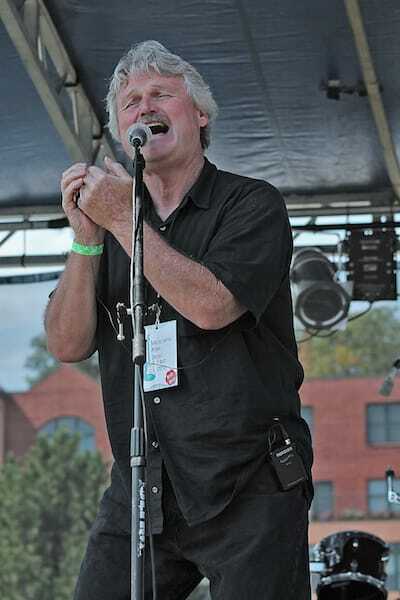 David McChesney performs harmonica as “Hurricane David” at Marquette Area Blues Fest.